From Led Zeppelin's box set to Mel Gibson's most recent Hollywood production "Signs", crop circles have been a part of contemporary culture for many years, tough their occurrence is ecutories old from a cache of otherworldly stories on an international sale. And regardless of how far out the phenomenon may seem to some, the Parker crop circles tat appeared outside of Teton on Sat, Aug. 10 brought researchers and rubber- neckers and curious residents from Teton Valley to see for themselves what some call a hoax and others hail as a haunting. Local paranormal enthusiast Jeff Newsorn visited the crop circles with his father, Lloyd, on the Monday following their mysterious appearance. Newsomn explained tat the location of the crop circles in Bryon Parker's wheat field were near the old Then cemetery which follows a pattern of many other crop circles that have had a similar proximity to burial grounds. In support of Newsom~s claim, the Utah UFO Hunters, Dave Rosenfeld, Ryan Layton and Richard Neilson cite that the cemetery is located approximately 300 to 350 yards to the east of the formation, it has an underground well, and possibly has ties to an ancient Shoshone burial ground, according to their Web site. The researchers for the Utah UFO Hunter's Web site have deemed this formation authentic until future data, investigation or analysis results proves otherwise. While visiting the crop circles, Newsom heard several rumors of strange light orbs to the south nights before the formations appeared in the Parker's field, and a couple from Utah had seen similar orbs while walking within the circles. 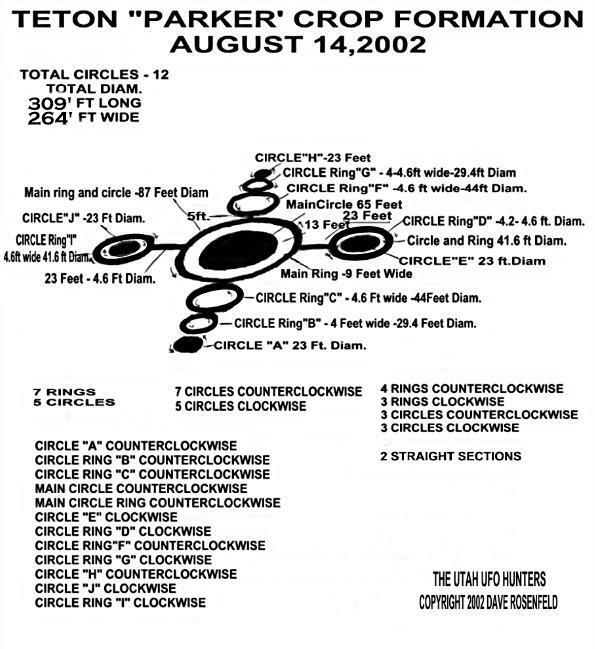 Susan Westad working with fellow researcher Don Anderson said she witnessed light orbs while inside the circle, and felt an energy shift when leaving the circle, according to the Utah group's Web site. Likewise, Anderson said the crop and ground felt different inside the circle and the air was also strange. As an aside, Newsom mentioned that a crop inspector who was visiting the Parkers' circles said that the same ground that was home to these crop circles was the scene of cattle mutilations back in the 70s, involving no blood but very precise, surgically done incisions. Newsom went on to explain that crop circles have been recorded for hundreds of years with a high rate of pranks as well as a high rate of the unexplainable. And while it took Hollywood crews 16 hours to create crop circles for Gibson's movie in broad daylight, the five or six hours it took for the Parker's crop circles to be formed was a very impressive feat. "Regardless of who did it," Newsom said, "it's an incredible piece of work." Mike Clelland, another local paranormal enthusiast, also visited the Parkers' crop circles and had sentiments similar to Newsorns. In an e-mail correspondence sent out on Friday, Clelland expresses that he is skeptical, but open to the paranormal possibility. "I have visited the site twice and, to me, it wouldn't be impossible to create these simple patterns. That said, I feel it would be very difficult to do such a tidy and elegant job," Clelland wrote. "When factoring in the odd lights that were seen by multiple witnesses, it makes the whole event even more cunous, and more difficult to declare a hoax. From my end, it seems to be a genuine mystery, and...if nothing else it's a beautifully crafted piece of art." In regard to the legitimacy of the Parker crop circles, Lloyd Newsom, Jeff's father, got a chance to question Bryon Parker's wife, Connie. "Can I assume that you are an honorable Christian that wouldn't pull a phony stunt," asked the venerable Newsorn. Parker assured Newsom that her conscience was clear. Lisandra Pinuelas of Driggs also visited the formations and had her own opinions. "If it was manmade, it wasn't those people (the Parkers) that made it. It was someone that came up from U.C. Berkeley," she said. In the introduction of what claims to be the largest crop circle site on the Internet, www.cropcircleconnector.com~ the bright balls of white light that were seen in Teton are reported to be in and around many crop circles. "Many of these lights have been filmed in broad daylight and the objects seem to move with purpose and intelligence," the Web site suggests. "What ever the crop circles are, they have per- plexed, moved and inspired people from all over the world. For those involved it has changed their lives forever, with the growing realization that we live in a world that is infinitely more complex and mysterious than we could ever have imagined." Dave Rosenfeld was joined by Ryan Layton and Richard Neilson of The Utah UFO Hunters to research the specific patterns in the Parker Crop Circles found recently in Teton.